According to Wikipedia, a "rat rod" is "a style of hot rod or custom car that, in most cases, imitates (or exaggerates) the early hot rods of the 40s, 50s, and 60s". 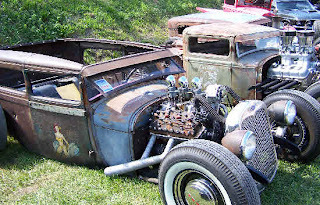 Hot Rod Concepts further states that Rat Rodz "are those that are pieced together to look like old time jalopies, although some times they require more work than a show rod". Most always, it is a hot rod with its body left rusty, and sometimes built with a very rough chassis or mismatched parts. Some rod owners like the term, while others think it's derogatory. Whatever your thoughts are, the PumpkinPalooza! Committee of the Lyons Main Street Program has announced the first PumpkinPalooza! Rat Rodz Show to coincide with the harvest festival now celebrating it's fourth year. The combination of a Rat Rodz Show and PumpkinPalooza! is a natural as the festival celebrates all things "pumpkin funky" while providing a venue for local organizations and businesses in the "local first" harvest celebration. As if Casket Races, Vehicle "Transformers", and the Great Pearl Street Pumpkin Race weren't enough, the committee felt that the rods would make a slightly ghoulish, vintage addition to the day of fun. All Rat Rodz will be featured in the PumpkinPalooza! Costume Parade and will be on display throughout the festival to garner votes for the best of show trophy. This years' PumpkinPalooza! is scheduled for Saturday, October 20th with a rain date of Saturday, October 27th. The entry fee is $10 per car and benefits the Lyons Main Street Program's ongoing efforts to revitalize the downtown Lyons business district. For an application, please contact lyonsmainstreetprogram@gmail.com or call 315-871-4220. 0 Comments to "Rat Rodz at PumpkinPalooza!"